When an incident occurs, you need the right people and equipment in place to effectively execute your mission. Mission Manager ensures first responders remain crisis-ready with current data so they can make the right decisions, quickly and efficiently, when faced with an emergency. 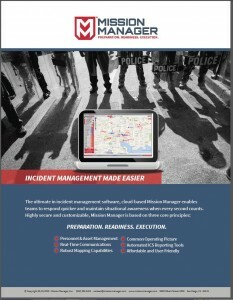 Learn how Mission Manager can help your team save lives and property by downloading our overview brochure.